Undefeated Magnum Moon, hero of the $1 million Arkansas Derby (G1), moved up to second, and My Boy Jack, winner of the $200,000 Stonestreet Lexington Stakes, jumped to 10th in the latest NTRA Top 3-Year-Old Poll after taking the final two prep races for the May 5 Kentucky Derby Presented by Woodford Reserve (G1). Magnum Moon (3 first-place votes; 324 points overall) led gate to wire in Saturday’s renewal of Oaklawn Park’s signature race, winning by four lengths to cap off an unprecedented Derby prep season for trainer Todd Pletcher, who has four of the top eight 3-year-olds in the poll. A two-time Kentucky Derby winner, Pletcher won four of this year’s major “Road to the Kentucky Derby Championship Series” races on four consecutive weekends with, chronologically, Noble Indy (119 points; eighth in the poll) in the Louisiana Derby (G2), Audible (7 first-place votes; 323 points overall; third in the poll) in the Florida Derby (G1), Vino Rosso (133 points overall; seventh in the poll) in the Wood Memorial (G2), and Magnum Moon. Santa Anita Derby (G1) winner Justify, also undefeated heading into the Kentucky Derby, received 21 first-place votes and 392 points overall to hold the top spot in the poll, results of which were released today by the National Thoroughbred Racing Association (NTRA). Last year’s Champion 2-Year-Old Good Magic (2; 287), who reestablished his elite form by winning the Grade 2 Blue Grass at Keeneland on April 7, sits in fourth. Bolt d’Oro (279), second to Justify in the Santa Anita Derby, was the highest-rated contender not to receive any first-place votes, tied for fifth with Mendelssohn (10; 279), the 18 1/2-length winner of the $2 million UAE Derby, who garnered 10 first-place votes. The winner of last year’s Breeders’ Cup Juvenile Turf (G1), based in Ireland, has not started in the U.S. in 2018 but has been eligible for the poll since he was known to be targeting the Kentucky Derby. Enticed (60), second in the Wood on April 7 despite being bothered by winner Vino Rosso in midstretch, held steady in the ninth spot. My Boy Jack (44) cracked the top 10 after passing nearly the whole field, going ninth to first to win by a head, in the Lexington. In the NTRA Top Thoroughbred Poll for horses of all ages, City of Light (2 first-place votes; 235 points overall) impressed voters enough to jump to second off a win in the Oaklawn Park Handicap (G2). It was the 4-year-old’s first major victory going two turns after a pair of Grade 1 wins sprinting. Also new to the rankings this week, in ninth, was Heart to Heart, winner of the Maker’s 46 Mile (G1) at Keeneland and now a two-time Grade 1 winner on the grass after also taking the Gulfstream Park Turf Stakes (G1) in February. 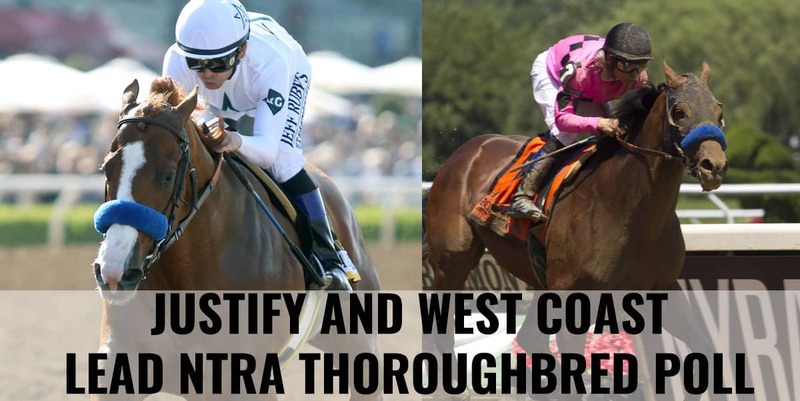 West Coast, runner-up in the world’s two richest races – the $16 million Pegasus World Cup Invitational and the $10 million Dubai World Cup – remains the clear leader among older horses in the U.S. The 4-year-old garnered 28 of 43 first-place votes and 411 points overall. Eclipse Award-winning Champion Female Sprinter Unique Bella (191 points) stumbled from second to fifth in the poll after a poor start compromised her chances in Friday’s Apple Blossom (G1) at Oaklawn. The 4-year-old filly rushed up to get back into the race and finish second. She remains the highest-rated female in the poll. After West Coast and City of Light, the remainder of the top 10 was comprised of Mind Your Biscuits (3 first-place votes; 230 points), Accelerate (207), Unique Bella (191), Army Mule (1; 164), retired 2017 Horse of the Year Gun Runner (9; 123), World Approval (103), and, tied for 10th, Heart to Heart (83) and Roy H (83). World Approval and Heart to Heart are turf specialists. Mind Your Biscuits and Roy H are sprinters. The full results for both weekly NTRA Thoroughbred polls can be found on the NTRA website at: http://ntra.kinsta.com/ntra-top-thoroughbred-poll-april-16-2018. Full accounting of top 10 votes, by voter: http://ntra.kinsta.com/wp-content/uploads/Polls-week12-by_voter-2018.pdf.